NETWORK UPDATE: SUNDAY NIGHT FOOTBALL adjusted up to 7.6, down 0.6 from last week’s final rating. 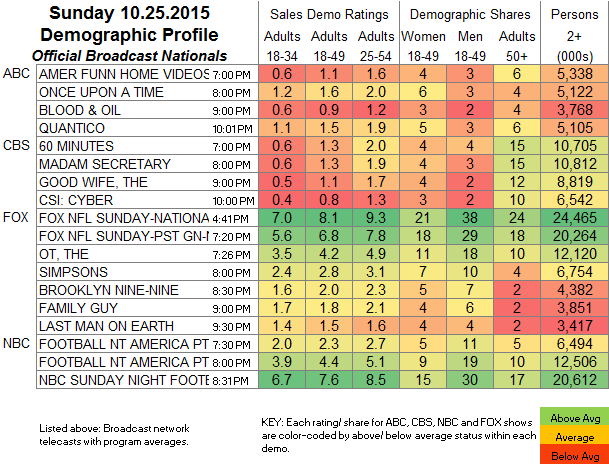 Both THE SIMPSONS and THE LAST MAN ON EARTH went up 0.1 in final numbers, as did THE GOOD WIFE. CABLE HIGHLIGHTS: THE WALKING DEAD climbed 0.52 from last week to an even more towering 6.69, but the more interesting question may be what happens next week, after the dramatic events of this episode. Its TALKING DEAD post-show, very possibly helped by viewers’ need to hear more about what they’d just seen (or thought they’d seen, depending on your theory), was up even more sharply, by 1.02 to 3.10. 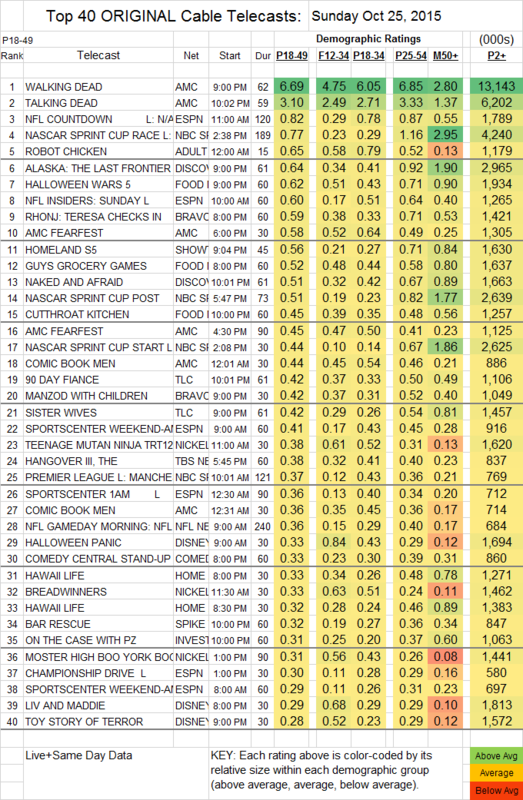 The AMC night concluded with COMIC BOOK MEN, down 0.03 to 0.44, with 0.36 in its 2d half-hour. NBC Sports Net’s NASCAR race was at 0.77. Adult Swim’s ROBOT CHICKEN gained 0.06 to 0.65. On Discovery, ALASKA: THE LAST FRONTIER jumped 0.19 to 0.64, and NAKED & AFRAID rose 0.04 to 0.51. On Food Network, HALLOWEEN WARS climbed 0.11 to 0.62, GUY’S GROCERY GAMES was up 0.02 to 0.52, and CUTTHROAT KITCHEN edged up 0.02 to 0.45. Bravo’s TERESA CHECKS IN was up a tenth to 0.59, and MANZOD WITH CHILDREN also gained a tenth to 0.42. Showtime was again the leader on pay-TV, as HOMELAND leaped 0.19 to 0.56, and THE AFFAIR grew by 0.05 to 0.23. At HBO, THE LEFTOVERS dropped 0.12 to 0.26, and PROJECT GREENLIGHT fell 0.02 to 0.06/143K. On E!, DASH DOLLS lost 0.05 to 0.17, and HOUSE OF DVF dropped a tick to 0.10.